The Right Reverend Martin Seeley read Geography and then Theology at Jesus College, Cambridge, before a year at Ripon College, Cuddesdon. He was awarded the English Fellowship at Union Theological Seminary in New York City, and continued his ministerial training there. 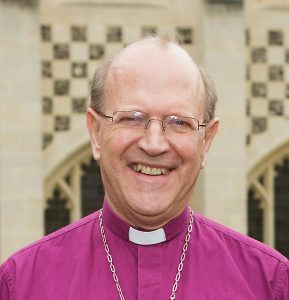 He served his title at the parish of Bottesford with Ashby, Scunthorpe in Lincoln Diocese from 1978 to 1980. He then returned to New York City where he served as curate at the Church of the Epiphany and Assistant Director of Trinity Institute, Trinity Wall Street, from 1980 to 1985. From 1985 to 1990 he was Executive Director of the Thompson Center, an ecumenical lay and clergy education programme in St Louis, Missouri. He returned to England in 1990, and until 1996 was a Selection Secretary at the Advisory Board of Ministry, and Secretary for Continuing Ministerial Education. From 1996 to 2006 he was Vicar of the Isle of Dogs, Tower Hamlets in the Diocese of London. Since 2006 he was Principal of Westcott House, Cambridge and from 2008, Honorary Canon at Ely Cathedral. He has also served as President of the Cambridge Theological Federation. He is married to the Reverend Jutta Brueck, Priest in Charge of St Thomas’ Ipswich, and they have two children, Anna, 16 and Luke, 13. He is a keen and able cook, and a keen but less able saxophonist.